The 1st Special Forces Command (Airborne) is a division-level special operation forces command within the US Army Special Operations Command. The command was established on 30 September 2014, grouping together the Army Special Forces (a.k.a. 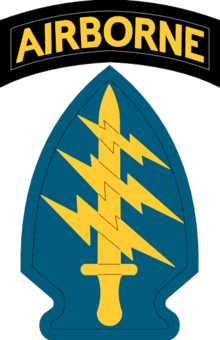 the Green Berets), Psychological Operations (or PSYOP), Civil Affairs, and support troops into a single organization operating out of its new headquarters building at Fort Bragg, NC. MG E. John Deedrick Jr. The main task of the 1st Special Forces Command is to assemble a force specifically tailored for dealing with any unconventional issue that's required within a designed area of responsibility, utilizing a mix of traditional combat and unconventional warfare units. The mission of 1SFC (A) is to organize, equip, train, and validate forces to conduct full spectrum special operations in support of United States Special Operations Command (USSOCOM), Geographic Combatant Commanders, American ambassadors, and other governmental agencies. The new command includes an organic military intelligence battalion, all seven Special Forces groups (including the five active duty and two Army National Guard groups), two Psychological Operations groups, a civil affairs brigade, and a sustainment brigade. The Command has the ability to rapidly deploy a high-level headquarters to run sustained, unconventional campaigns in foreign theaters. 1st SFC(A) MI BN performs direct multi-source military intelligence support to the 1st Special Forces Command. 20th SFG(A) (ARNG) that are trained for unconventional warfare, foreign internal defense, special reconnaissance, direct action, and counter-terrorism missions. Special Troops Battalion, an ARSOF Support Operations Cell, six ARSOF Liaison Elements, and two Medical Role II teams. On December 21, 2016, Stars and Stripes reported that the 1st Special Forces Command were taking part in Operation Inherent Resolve as the Special Operations Joint Task Force – Operation Inherent Resolve. ^ Trevithick, Joseph (26 November 2014). "The U.S. Army Has Quietly Created a New Commando Division". Medium.com. Retrieved 25 February 2015. ^ Rogers, Darsie. "1st Special Forces Command (Airborne)" (PDF). Benning Army. p. 11. Archived from the original (PDF) on 4 November 2014. Retrieved 25 February 2015. ^ Scott Tyson, Ann (17 December 2014). "NEW ELITE DIVISION-LEVEL UNIT CREATED BY ARMY". Retrieved 25 February 2015. ^ "'We're a significant presence:' General updates Fort Bragg troops on Islamic State fight". military.com. 21 December 2016.